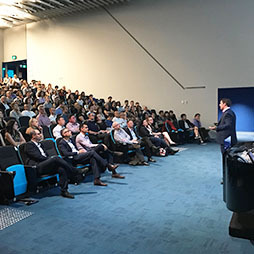 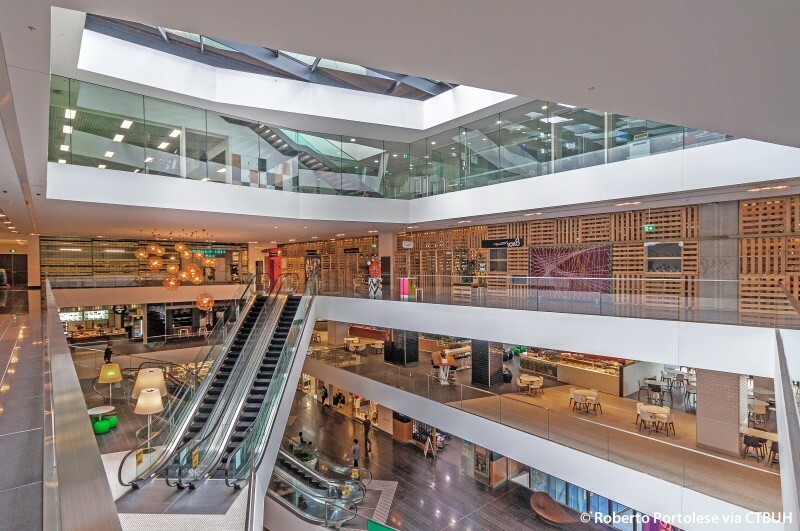 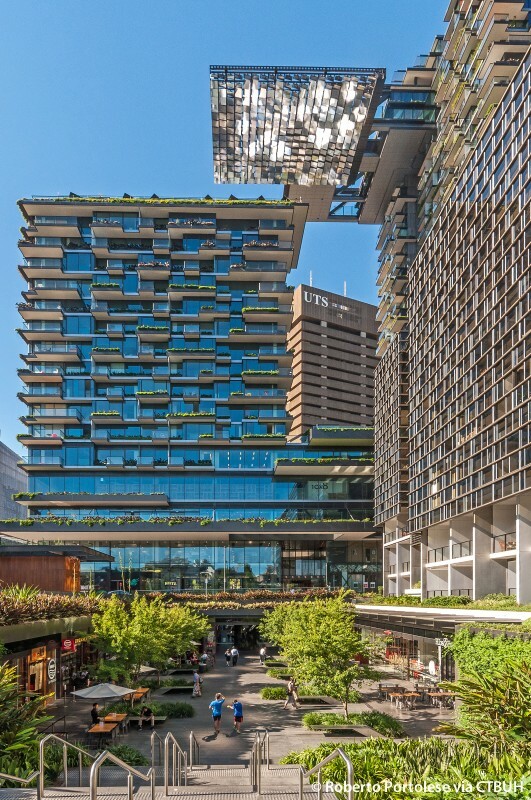 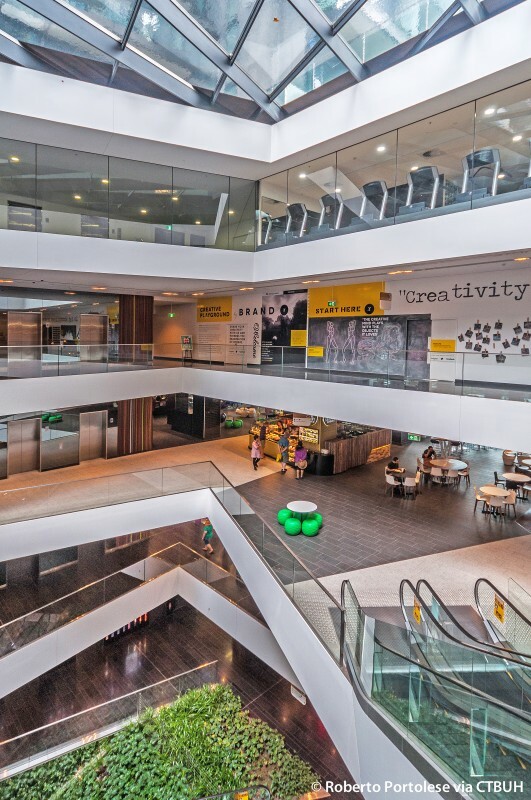 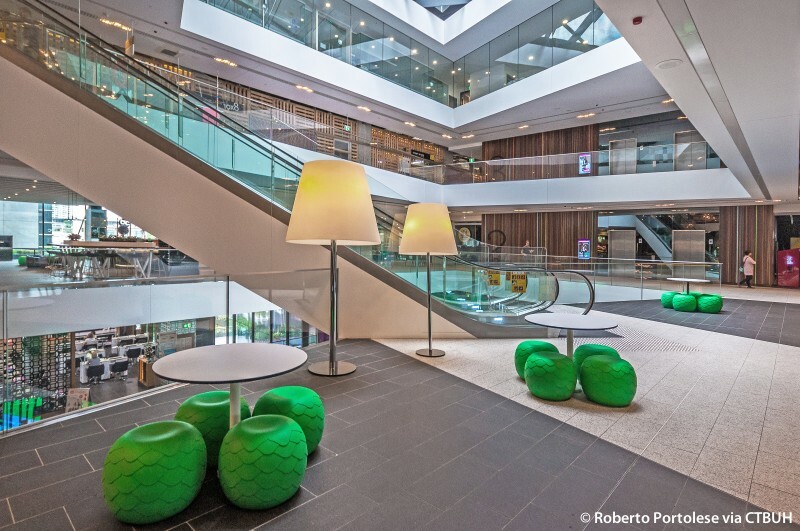 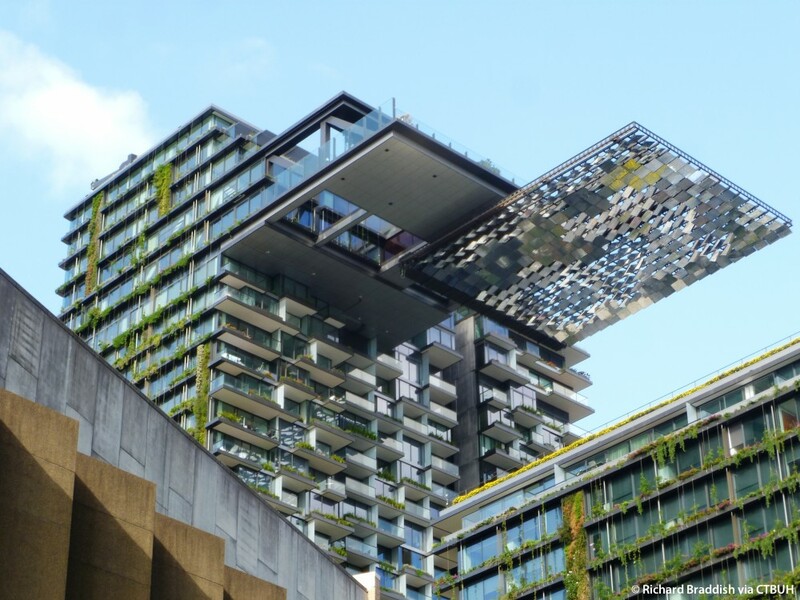 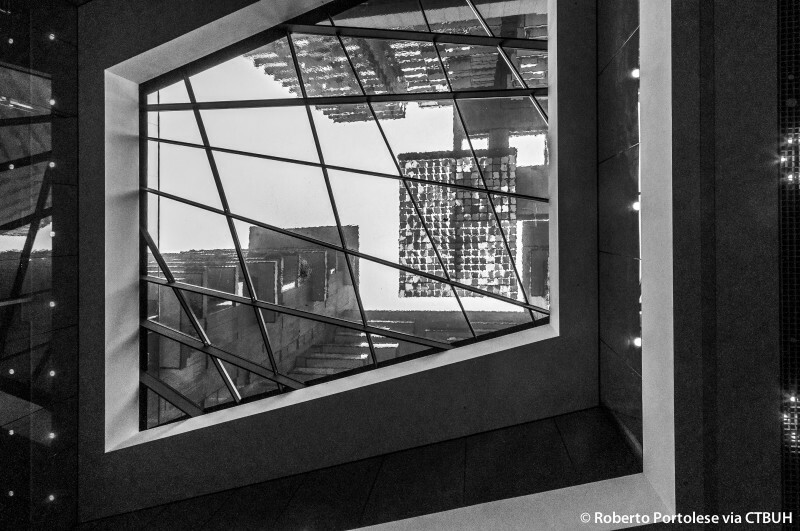 One Central Park (OCP) is an innovative and environmentally ambitious landmark project within the redevelopment of the Carlton & United Brewery site near Central Station in Sydney. 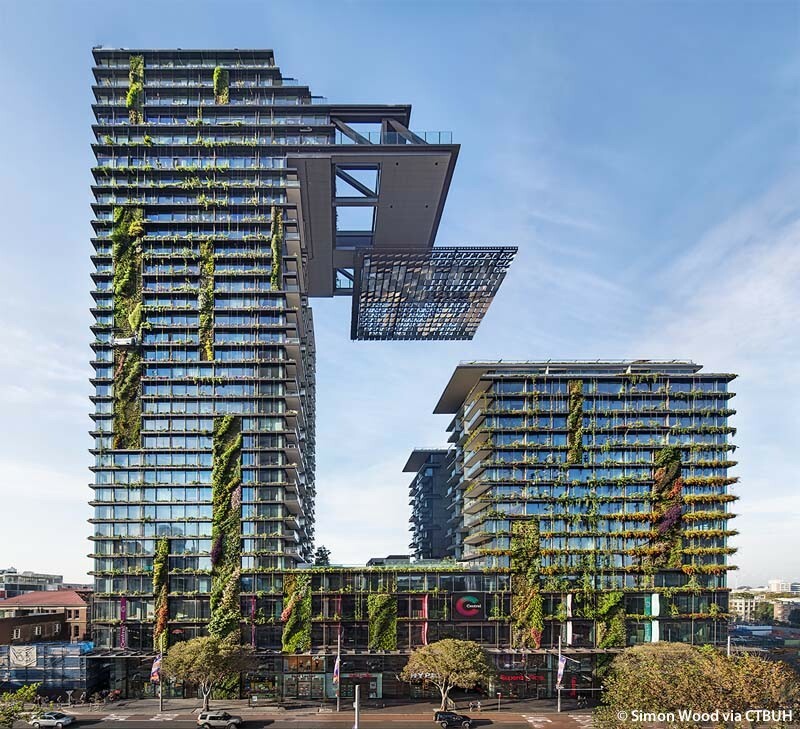 The overall planning intent is to adhere to the highest standards of sustainable residential design under the Australian Green Star rating system and support the vision of an environmentally responsible future for the city. 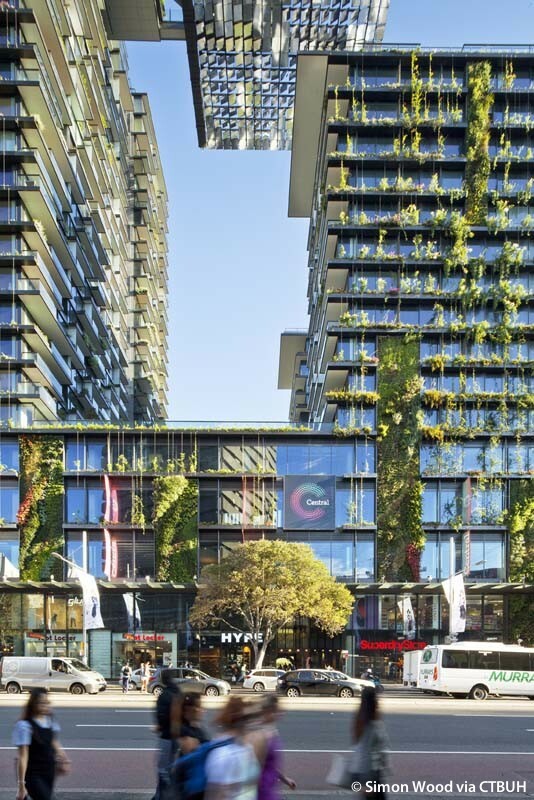 In order to make the two towers of OCP visibly greener than is normally perceivable in Green Star developments, the design takes a broader approach to carbon-conscious design. 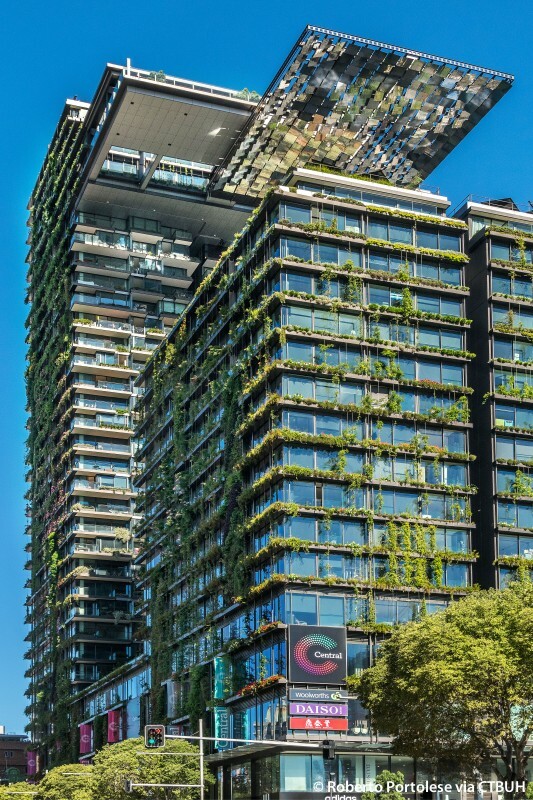 With the help of two unusual technologies - hydroponics and heliostats - plants are grown all around the building to provide organic shading, and direct sunlight is harvested all year long for heating and lighting. 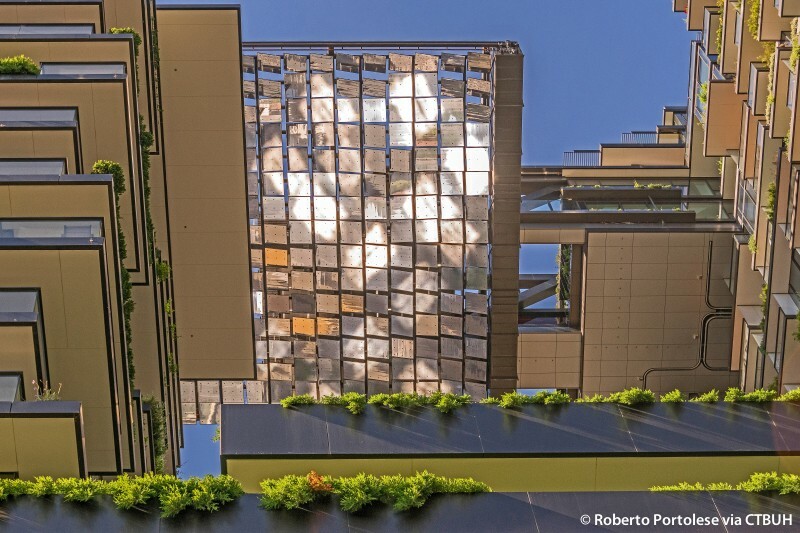 The shading saves cooling energy, while the redirected sunlight is an all-year light source for the building precinct and adjoining park. 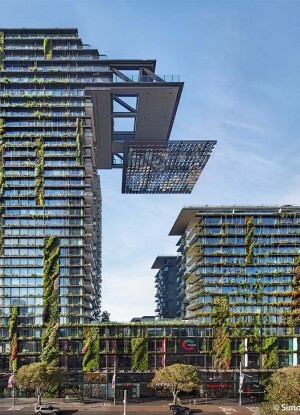 Beyond the bravado of their technical deployment and performance, the plants and reflected daylight are also just natural resources, made available in an unusual way for the enjoyment of Sydney's residents. 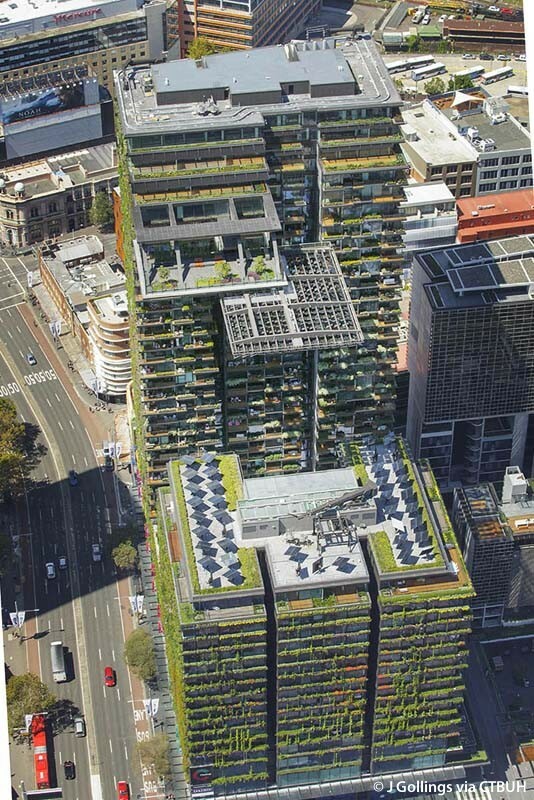 Of particular note is the inclusion of a park at the tower’s base. 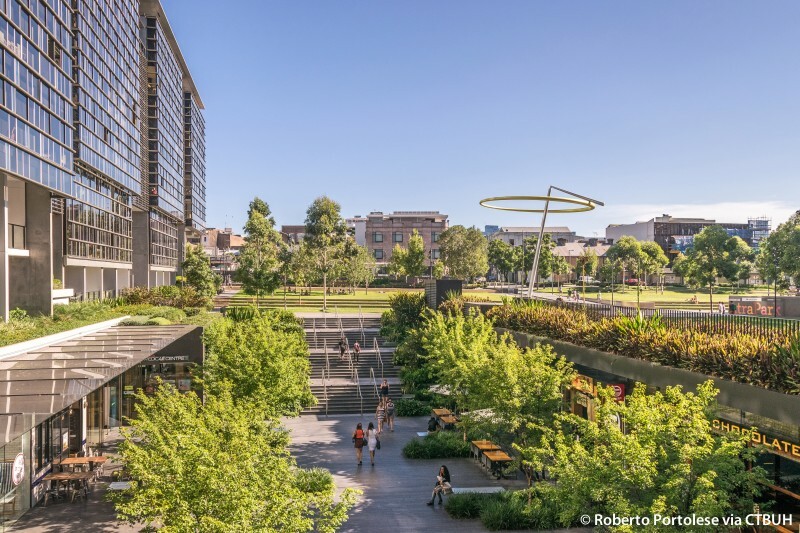 The first design challenge was to give the new park a real presence at an urban scale. 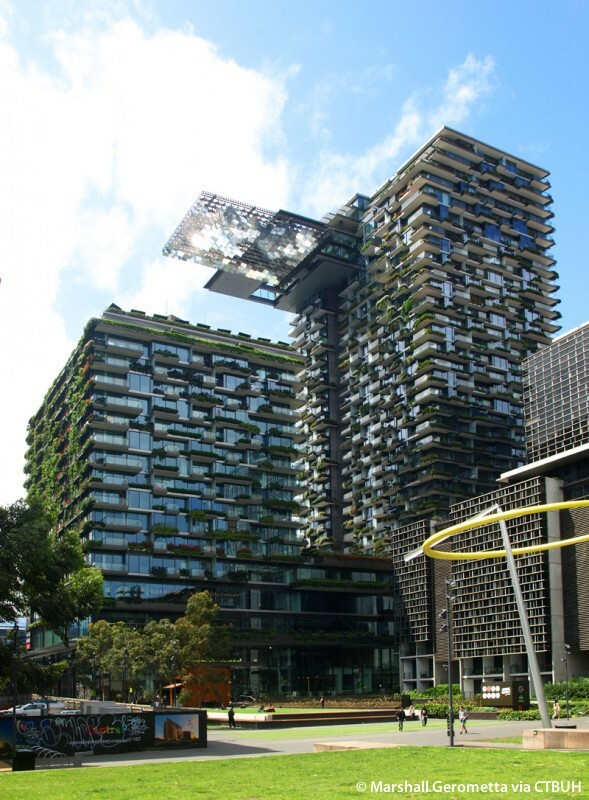 Because OCP is a high-rise, it is possible to bring the park up into the sky along its facades and make it visible in the city at a distance. 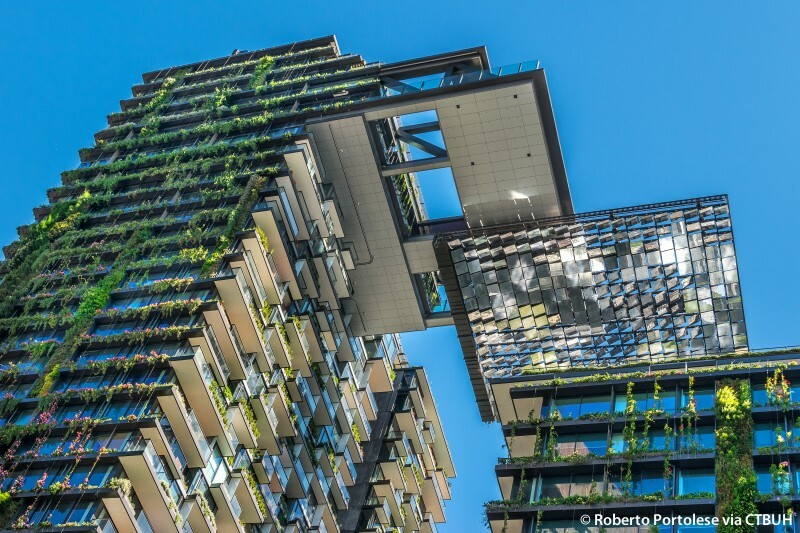 On the south side, the park rises in a sequence of planted plateaus scattered like puzzle pieces in randomized patterns across the facades, so that each apartment has not only a balcony, but also its own piece of the park. 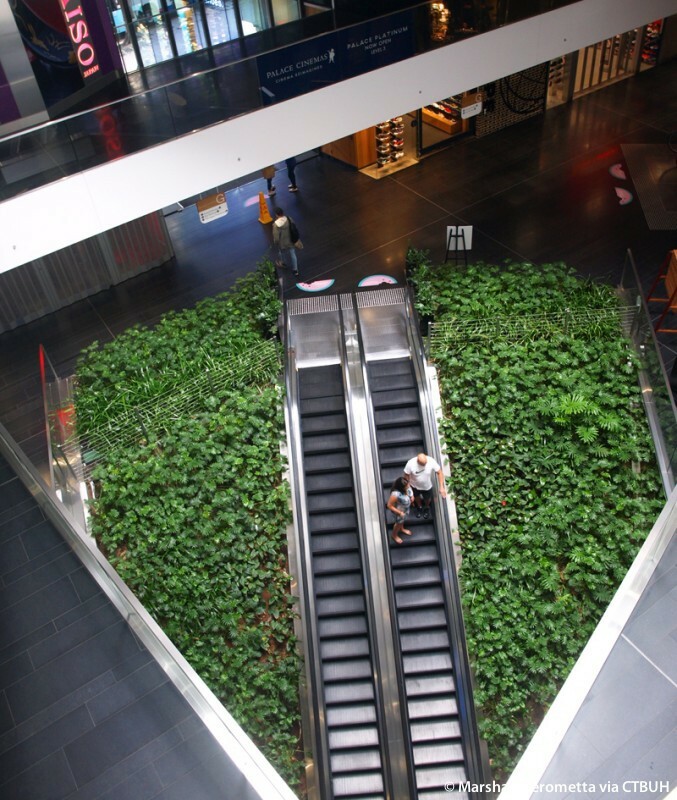 At the individual scale, this creates pleasant private gardens. 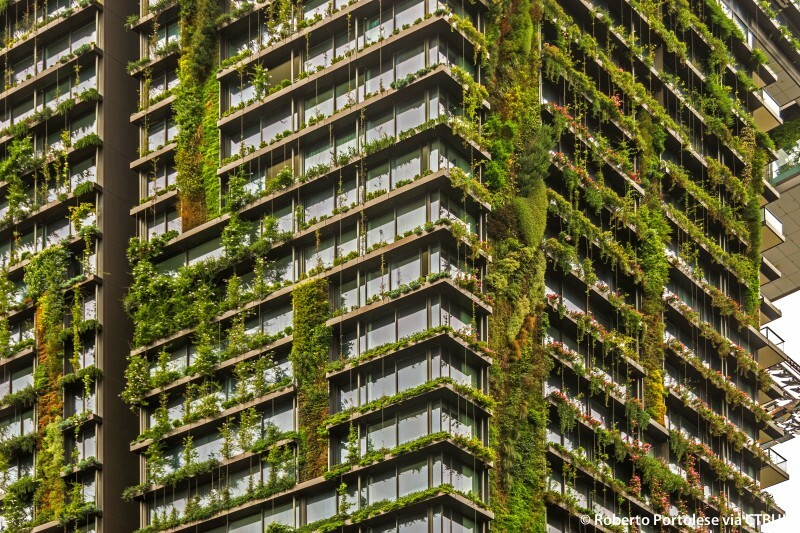 At a collective scale, it’s a green urban sculpture. 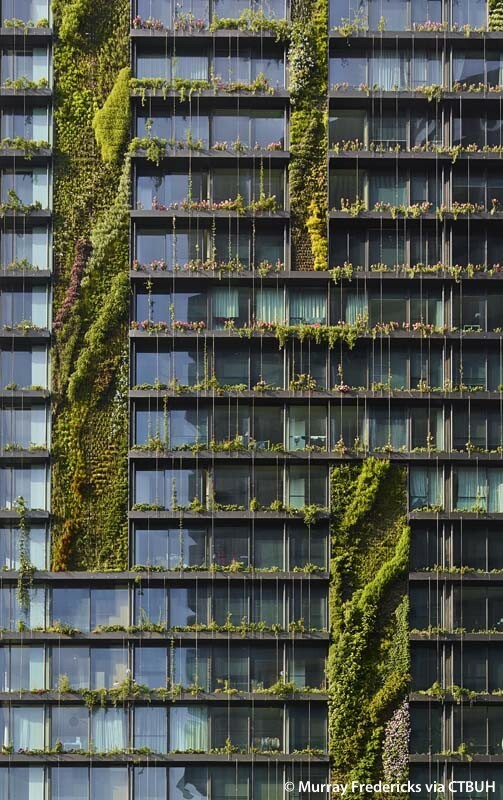 On the north, east and west sides, the green takes more continuous veil-like appearances with green walls, continuous planter bands and climbing vegetation. 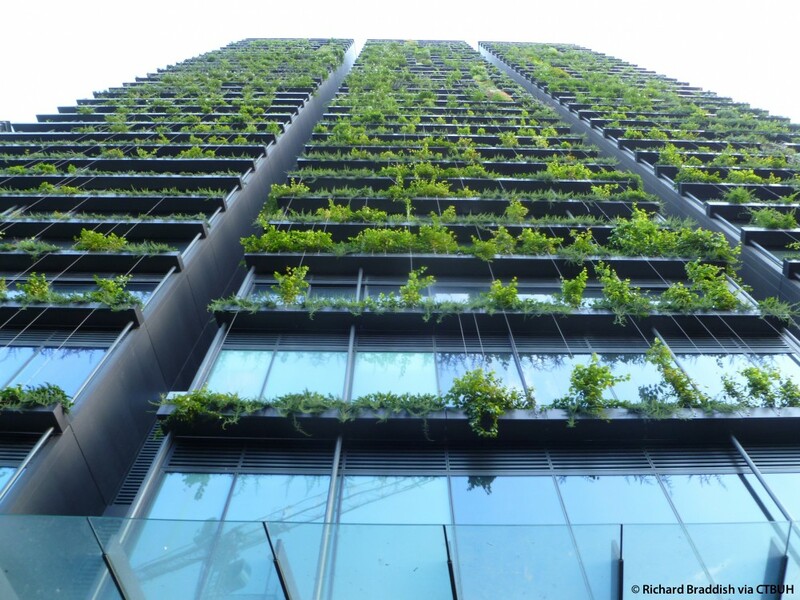 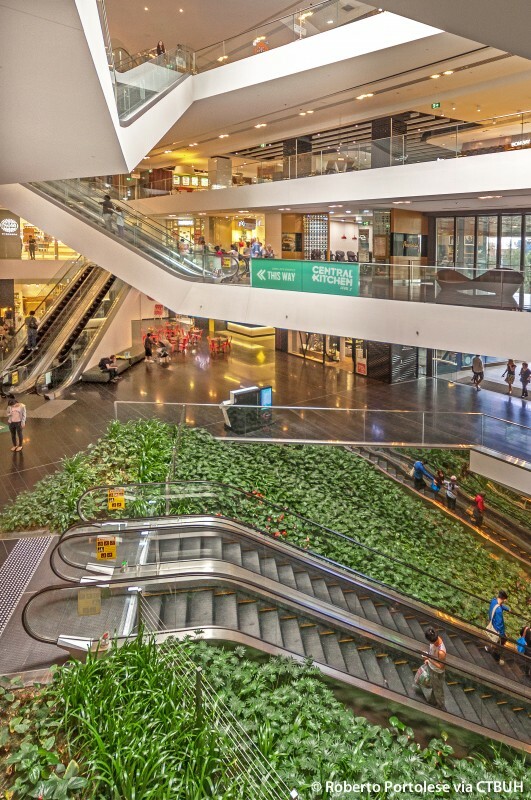 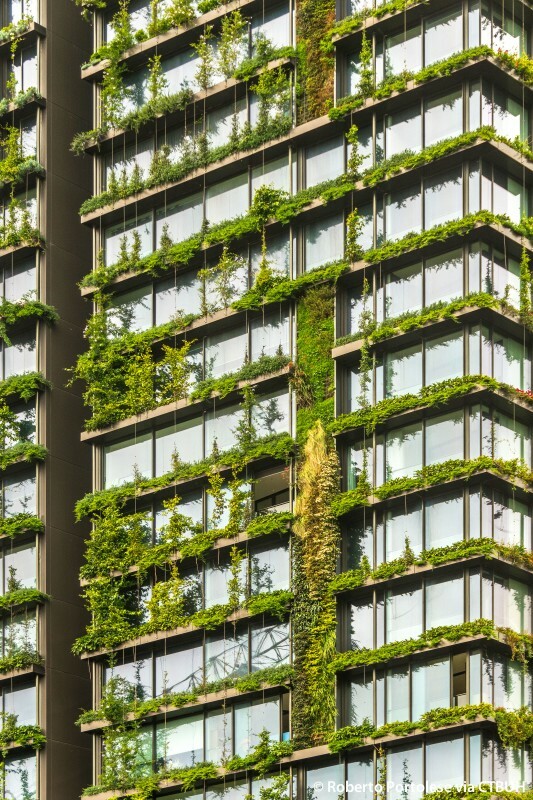 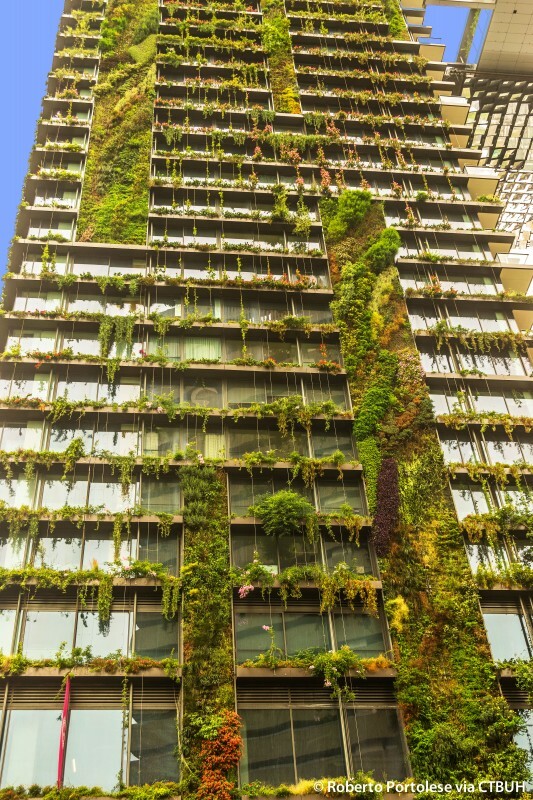 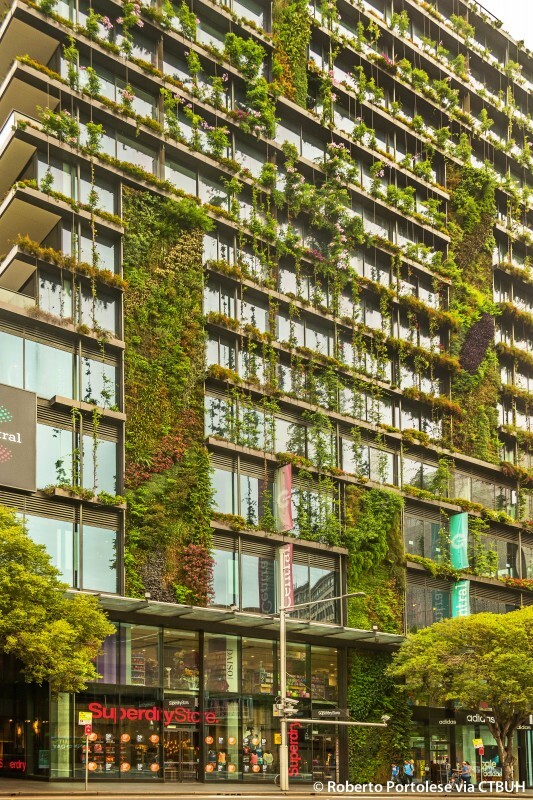 The plants deliver a message of sustainability, and because their shade reduces energy consumption for cooling and their leaves trap carbon dioxide, they also effectively make the building more sustainable. 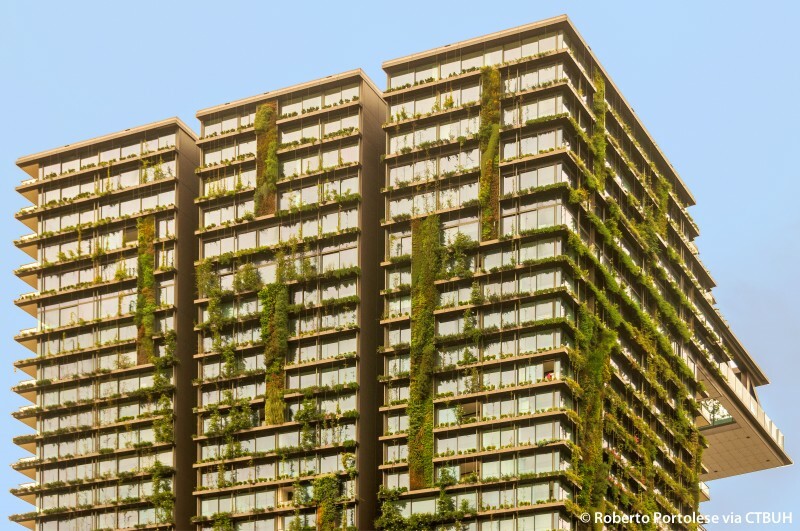 In total, more than 5 kilometers of planters function like permanent shading shelves and reduce thermal impact in the apartments by up to 30 percent. 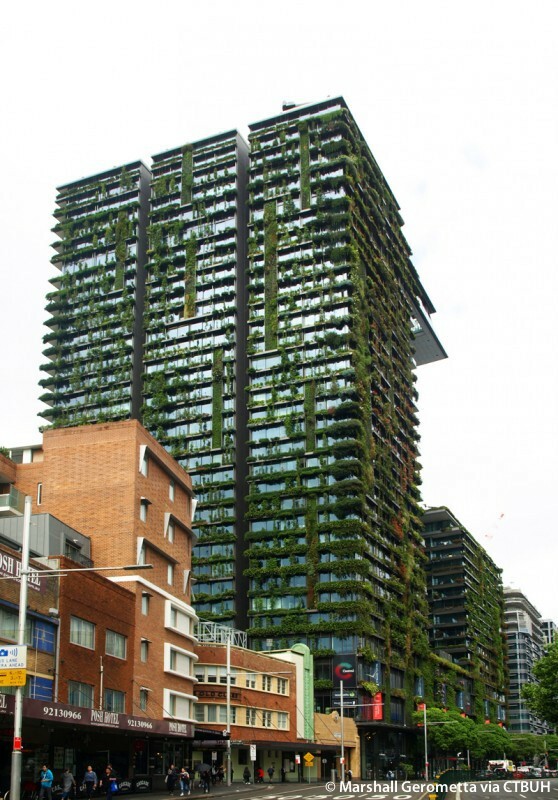 The plants also trap Carbon Dioxide, emit Oxygen and reflect less heat back into the city than traditional fixed shading. 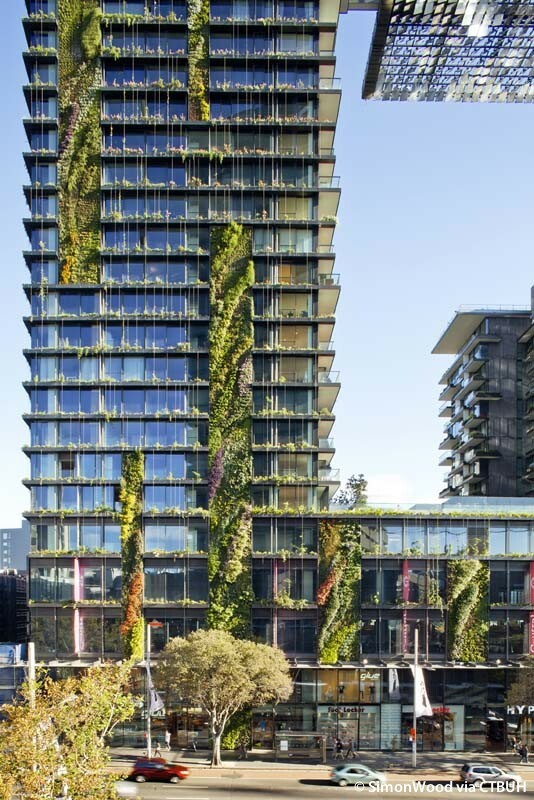 The plants are irrigated with recycled grey and black water, and their growth can be custom-tailored to the needs of each façade area. 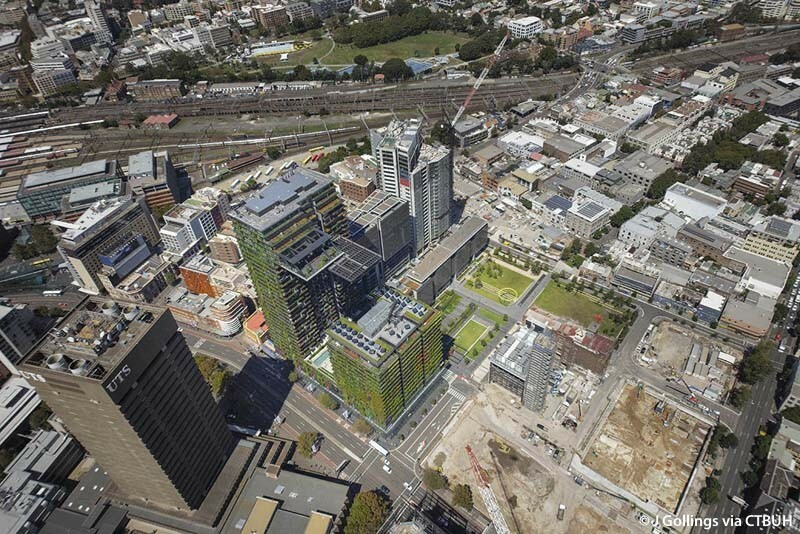 A design challenge arises from the tall massing along the north side of the site. 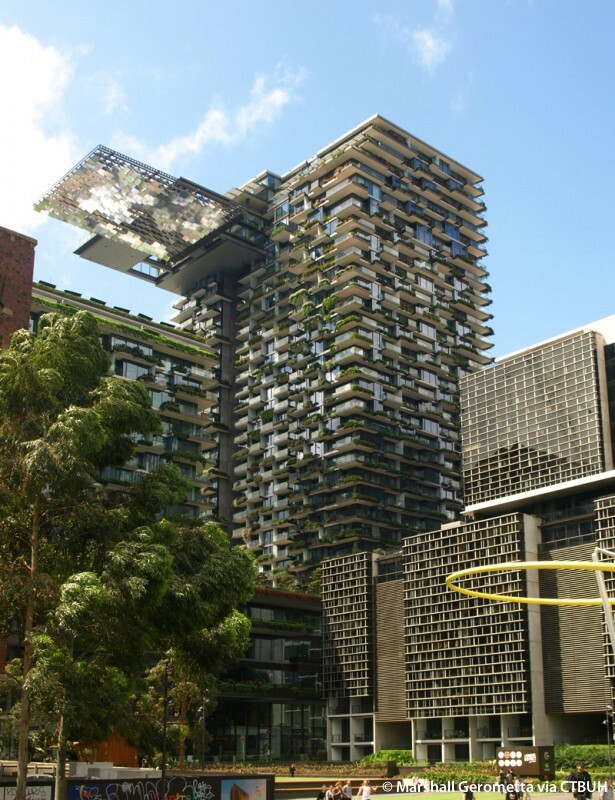 In order to remediate overshadowing of the park, the volume is broken up into a lower and a taller tower. 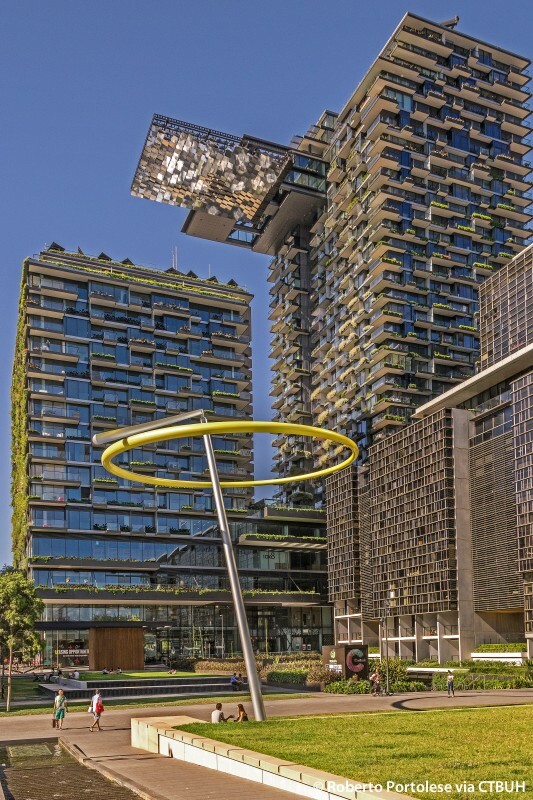 On the roof of the lower tower, 42 heliostats (sunlight tracking mirrors) redirect sunlight up to 320 reflectors on a cantilever off the taller tower, which then beam the light down into areas that would otherwise be in permanent shade. 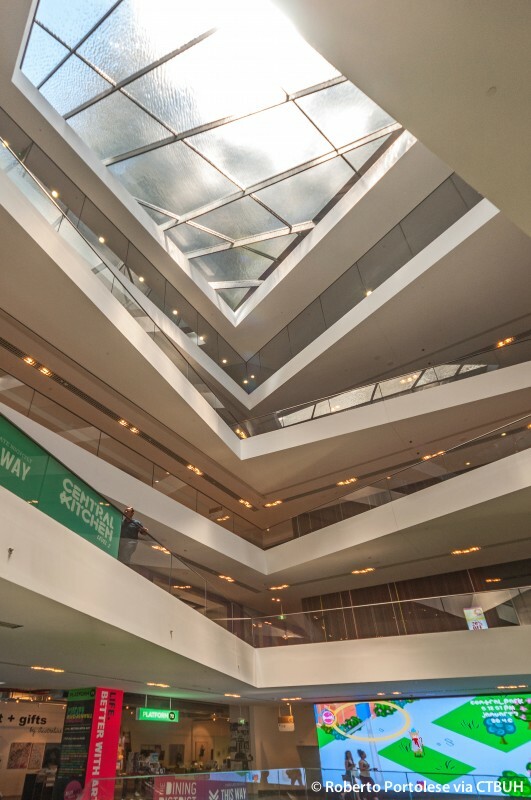 The system adapts hourly and seasonally to the need for brightness and warmth, redirecting heat to absorbent pool of water atop the atrium glass in summer, which can be drained to assist with heating in the winter. 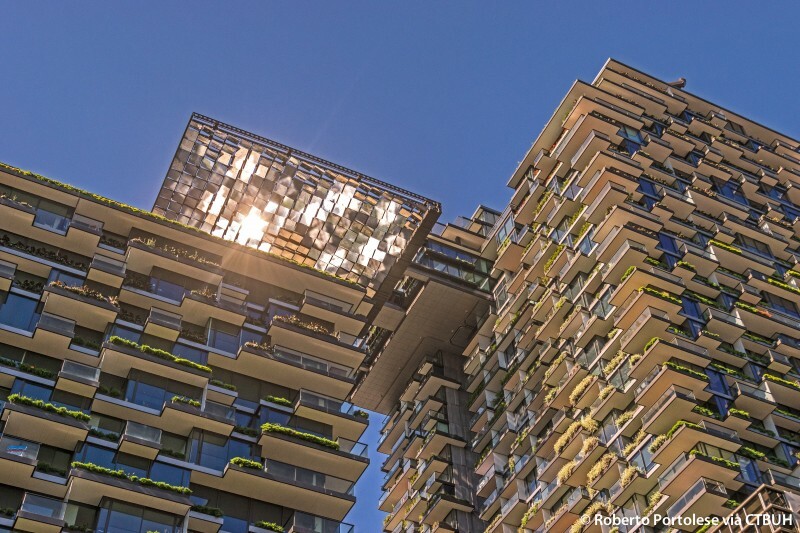 The system redirects up to 200 square meters of direct sunlight and utilizes approximately 40 percent of the corresponding power during Sydney’s 26,00 annual sunshine hours. 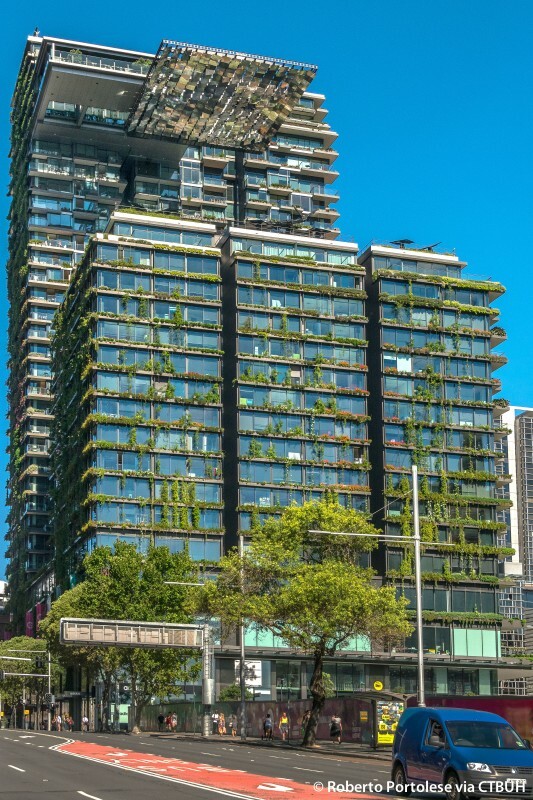 The performance of this system is not accounted for in the BASIX (Building Sustainability Index of New South Wales) and Green Star calculations. 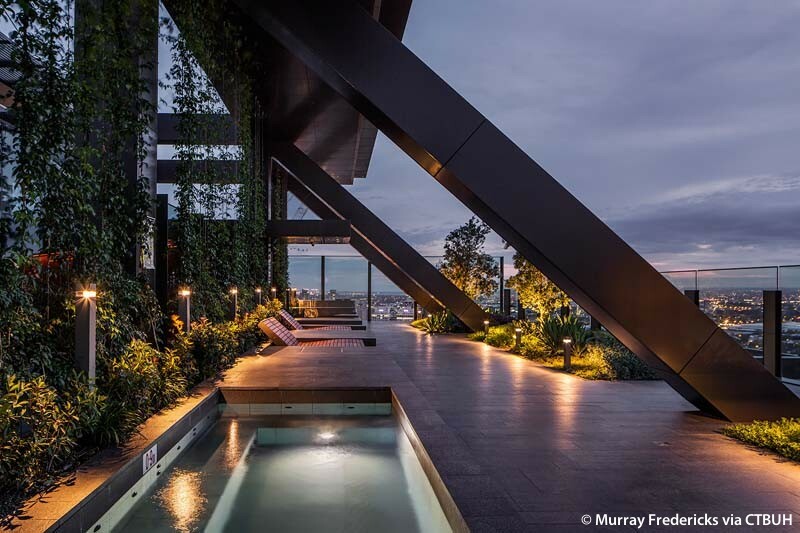 Dappled lights move on the ground in a precisely programmed choreography. 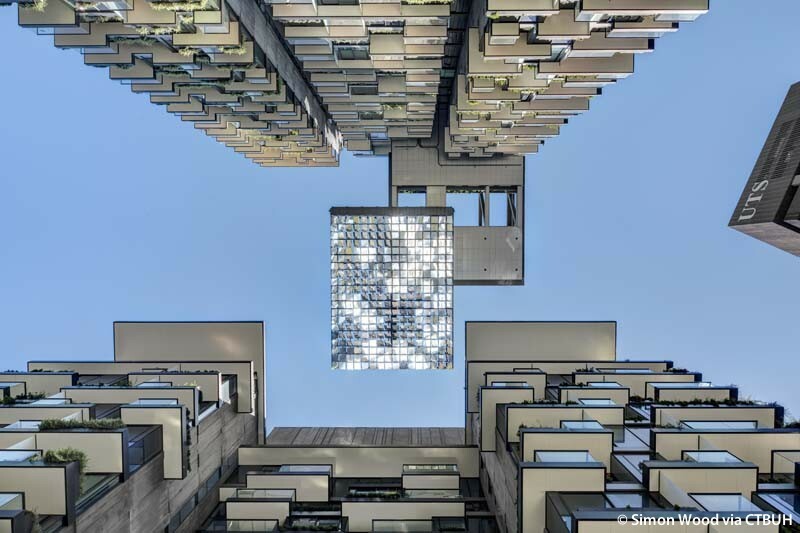 At night, the heliostat becomes a monumental urban chandelier and appears in the dark sky like a floating pool of tiny LED lights that merge into a giant screen and simulate reflections of glittering harbor waters. 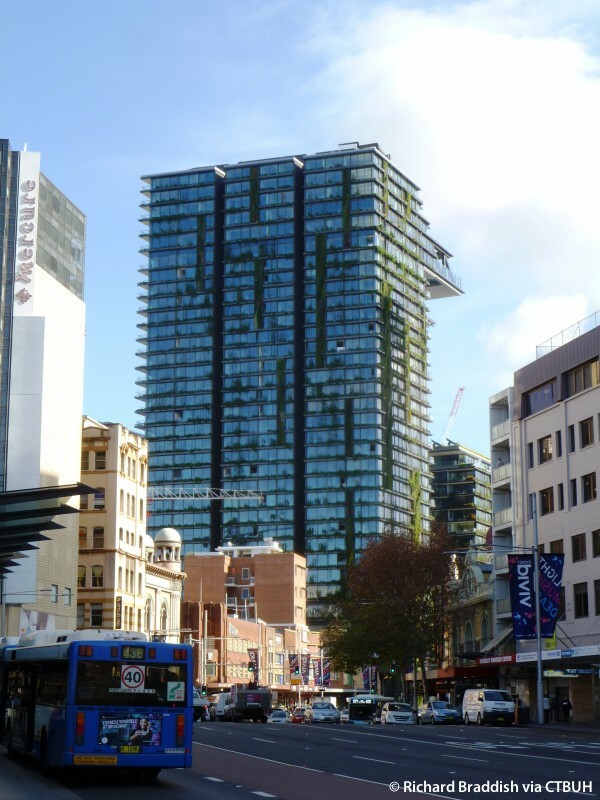 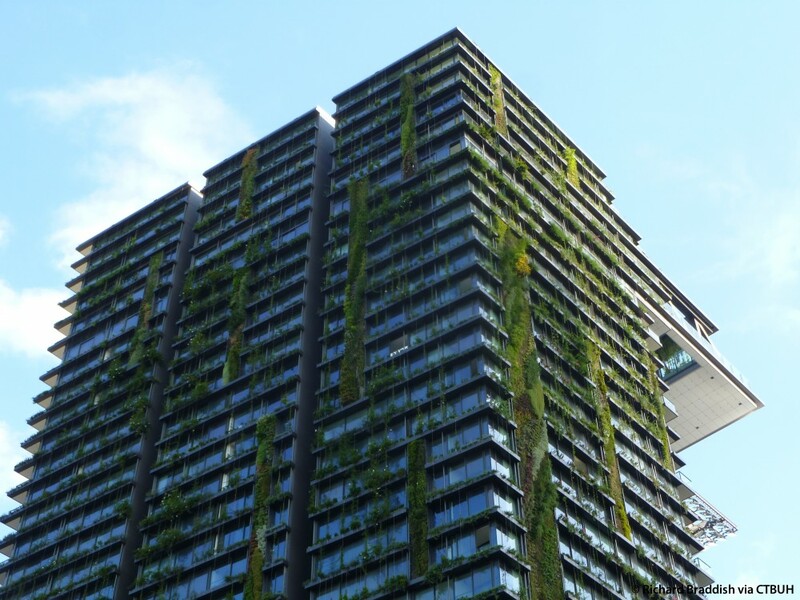 One Central Park assists Sydney in its goal of moving towards improving its carbon footprint. 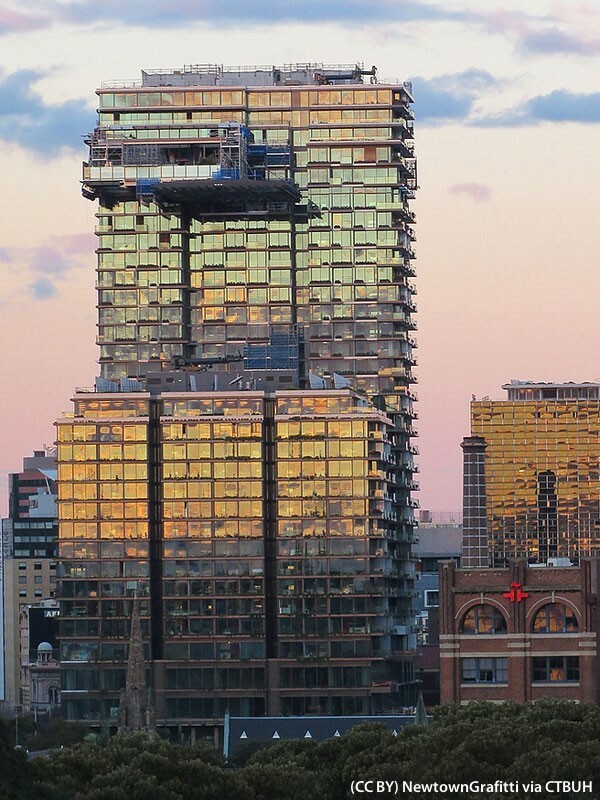 The project provides much-needed apartments in the city’s main job market at its urban core. 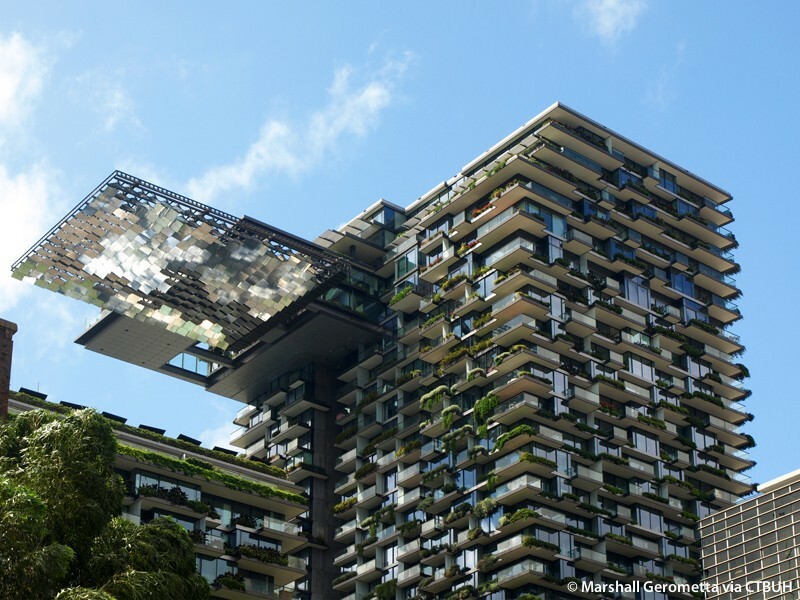 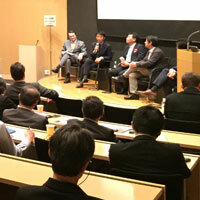 It reduces energy consumption by 25 percent when compared to a conventional building of its size. 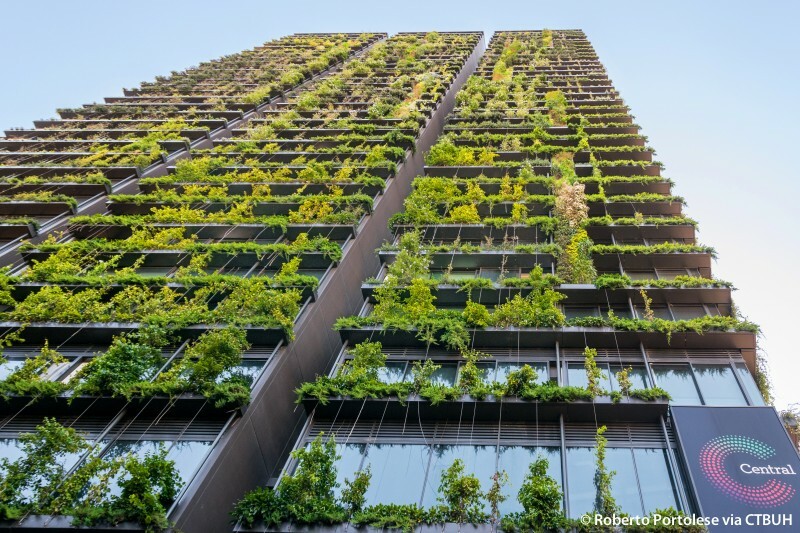 Thermal impact of sunlight on the building is reduced by up to 30 percent because of the presence of greenery, which of course traps carbon dioxide and emits oxygen as well.